Welcome to Saturday Spotlight, where we dive into the lives of Ohio State student-athletes and learn more about their journeys to Columbus, their love of the Buckeye traditions and who they are as competitors and students. Maxime Hervoir has been with the Ohio State program for two years. A native of Royan, France, Hervoir spent two years at IUT Informatique Montpellier in Montpellier, France (2013-15). He competed for the French National Team in 2014, played in the highest national amateur league in France, and is a Two-time French Cup winner, named "Best Outside Hitter" in 2015. Hervoir is one of two Frenchmen on the Ohio State roster, along with fellow senior superstar Nicholas Szerszen. We sat down with him to talk about his interests off the court, his favorite French food, and proudest volleyball moment. When did you realize you had a chance to play volleyball at the collegiate level? Maxime Hervoir: I was in France playing for eight years already and I actually was watching some collegiate level volleyball and I was like 'I can play at this level.' I wanted to go to America to further my studies and Ohio State was really combining everything I needed: Playing good volleyball, having a new experience with the language, and furthering my studies. What drew you to Ohio State outside of volleyball? MH: I had a choice between a few universities, but the choice was not that hard because Ohio State was the best team in the country and already won the championship the year before I came so I was really into it. My friend Nick [Szerszen] was here and he told me a lot about Ohio State and that it was awesome so my choice was not hard. What is your proudest volleyball moment? MH: I guess that was winning the championship last year. To win at home in front of everybody was amazing. My dad came with my uncle from France. I made all-tournament team so that was a huge honor and very awesome. What do you like to do when you are not playing volleyball? MH: I'm a big fan of computer science. I'm a huge nerd. I code just for pleasure. I actually enjoy watching shows and even some anime. But other than that, I love having time for myself and seeing some friends outside volleyball. What are you studying? What has been your favorite class so far at Ohio State? MH: I'm studyng communication specifically in new media and technology. I'm interested in a lot of fields. I love science. I took a class about life in the universe and it was very interesting to me. I love astronomy. Other than that I liked the "design class" because I learned how to use Photoshop. MH: I've thought about it many times in every possible way. I would love to be able to teleport. It would be the best. What is your favorite French food? MH: People ask me that a lot. Usually I'm saying crepes. In France we do crepes for meals not just desserts. I like them with ham and cheese. What is your favorite American food or meal you have had while in Columbus? MH: I love food. All food. Every type of food. I ate some ribeye steak in California that were the best of my life. You Americans are great meat cooks. What is something about you that we wouldn't believe? I have three older sisters and five nieces, I have a god-daughter. I'm basically the only boy in my family. MH: The rivalry with Michigan is insane. The entire campus being prepared for the Michigan game every year is insane. All the M's on campus are taped. I didn't really grow up in a rivalry environment so that was very new. Maxime and the #5 ranked men's VolleyBucks take on Charleston (WV) this evening at 7:00. Their next home match is on Thursday at 7:00pm at St. John Arena vs. Ball State. 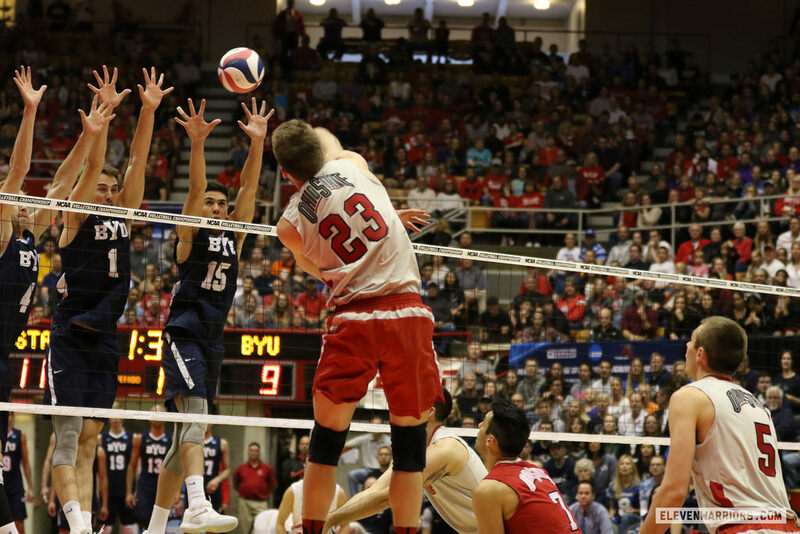 You can follow them on Twitter @OhioState_MVB.